Although 11 heads may be the standard fashion illustration height, you don’t have to stick to the rule. Change your drawing’s proportions by adding heads (the height of a head as a guideline for proportion, not actual heads) to places such as the torso or the legs. 1Create a new head template (add as many heads as you like). 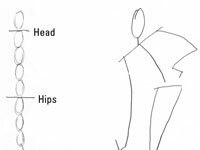 Then draw a quick stick figure that shows the exaggerated lengths and the angles in your pose. Create fun poses with your stick figure. For example, put one arm on the hip for attitude. 2Draw two trapezoid shapes over your lines to create the torso. 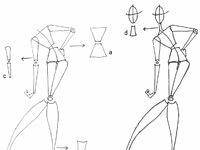 When creating an illustration with exaggerated proportions, you should still use your standard trapezoid shapes for the torso and cylinders for arms and legs. Add an oval for a head. 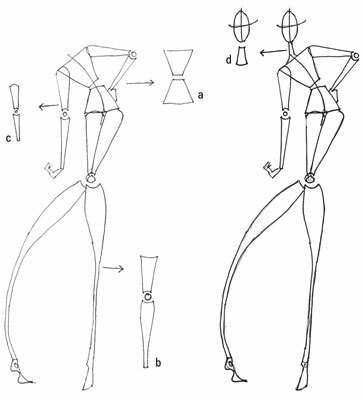 3Following your initial lines, draw long legs using cylinder shapes. 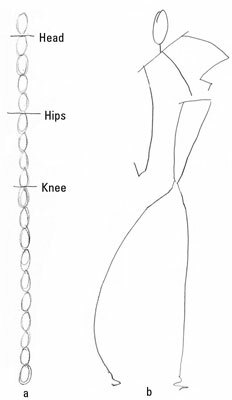 Try experimenting with leg proportions by making the upper half of the leg (thigh) significantly shorter than the shin or around the same length. Try to bend the lower cylinders in unreal directions. 4Add cylinders for long arms and an oval for the head. If you’d like, add personal touches, such as a hand flipped up or markings for the eyes and lips of the face.